Good Day! This week I have a great storage solution using old dresser drawers that I obtained for free! Everybody needs to store their clothes and items somewhere, and we all dream of having a beautiful chest of drawers to keep all of our stuff in. Living in a small abode I am always looking for ways to improve my storage needs, and storasge junk drawers fit the bill. I found this awesome dresser roadside a few weeks back and was so excited it had great french provincial lines, dovetail drawers, beautiful hardware, dark finish the whole shebang, I could not wait to redo it. Now I could have bought drawers from Office Monster quite easily, but I thought this would be more creative and fun! 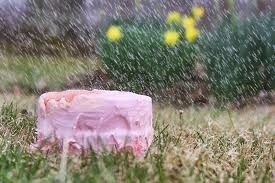 Unfortunately “someone left the cake out in the rain” so to speak, the day came across it, it was raining, no.. make that pouring. And you guessed it the dresser was severely structurally damaged. The drawers would not slide back in no matter what I tried, drying, sanding, candle wax, prodding, pushing, nothing, what a disappointment.. I had to dump the base…ugg. I thought about putting in basket drawers, or cutting out a few partitions between the drawers to revamp it into some other use a buffet maybe with little curtains or television console? But frankly I had no room to store a huge eight drawer dresser future project, my garage/studio is chock full of stuff for future projects already. So the storage junk drawer project begins. So off to the curb went the rest of this great piece for another person to salvage, because it was snatched up lickity split, so not a total loss there. 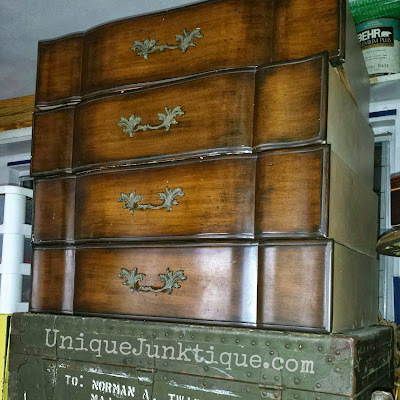 Now we have all seen repurposed drawers online, here are a few created Unique Junktique style, well not so unique but definitely junktique! One drawer had gotten seriously wet and held water a little to long because the bottom was completely warped, that one I’ll salvage the front and make a junk hanger plaque or something out of. The other seven are destined for repurposed storage junk drawers! Two I revamped for the kids room as underbed storage, and two were revamped for my bedroom for under my dresser. The remaining three will be for my future booth, and the last drawer face undecided as of yet. Here are some shots of the process. Here are how the drawers started out, dark brown finish, on top of an old 1950’s army trunk I scavenged. Time for the wheels, first added little cut blocks of wood so the screws would not poke through the drawers, used gorilla glue to make them extra secure, and screwed in little swivel castors. Remember ” the little table that could ” I did a few weeks back? It is residing in my kids room now, well I painted these drawers to match, I used CeCe Caldwell’s Chalk Paints in Traverse City Cherry, Blue Montana Sky, and Kentucky Mint, then both of Annie Sloan’s waxes to dirty it up a bit. Have you tried American Paint’s Grit yet? I can’t wait to try that stuff to gunk up some pieces! I debated whether or not to add the diamond plate here as well, to the sides but decided that since they would be under the bed and you would only see the fronts most of the time, I would save the diamond plate for another project. 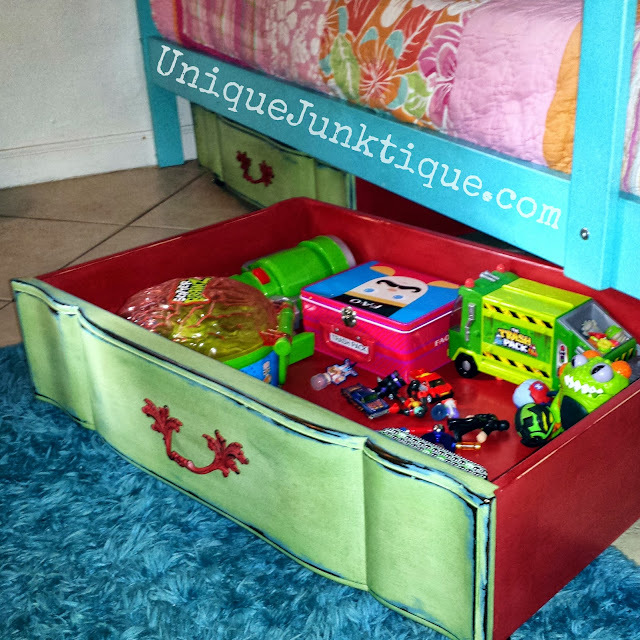 Now the kids have extra storage junk drawers for their toys Yay! 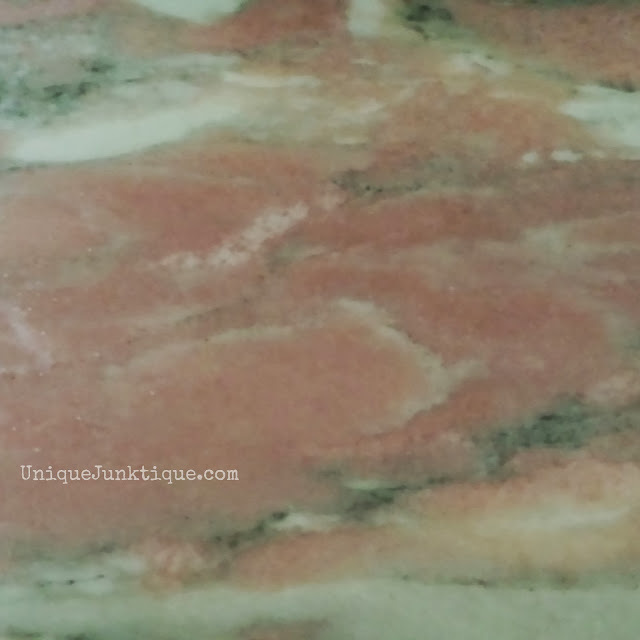 Next I have this great pink marble topped dresser I picked up at a thrift store a few years back. I am planning on repainting her but I wanted to do a color test on the junk drawers first. I tried to match up a paint to accent the marble top. These two drawers were lower in height, and fit under the dresser perfectly. 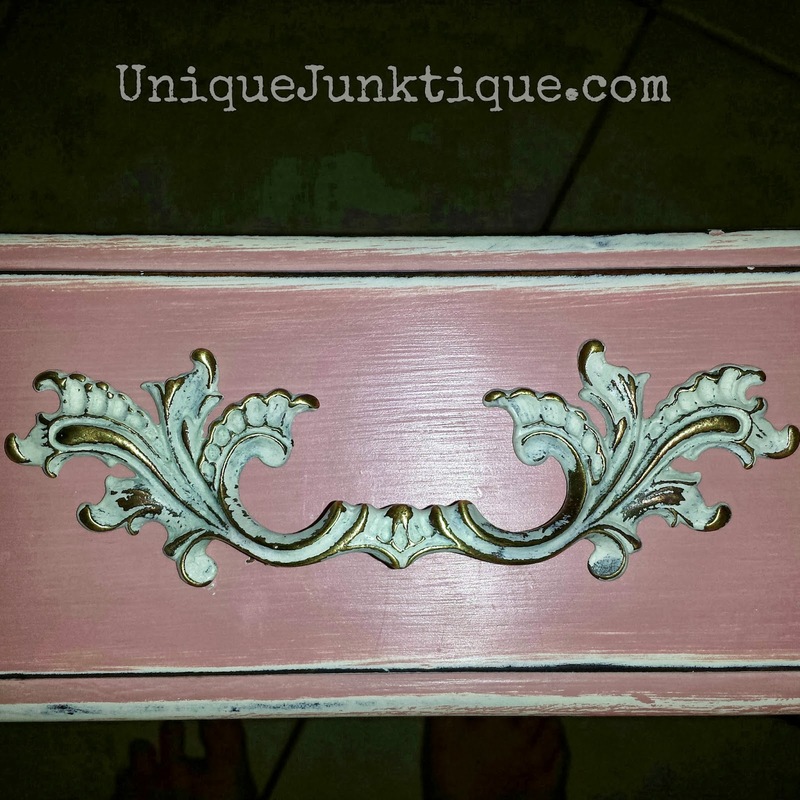 I purchased Annie Sloan Antoinette, when I got home I realized that pink had way to much of a blue hue to it and went back for some of her Scandinavian Pink which has more of an orange tone. 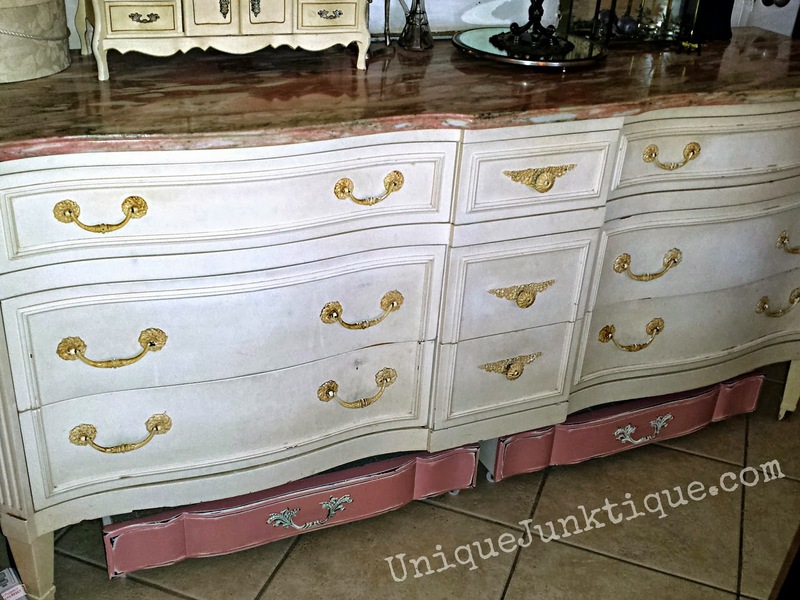 I ended up custom mixing the two to match the marble , base coat in Annie Sloan Old White, then custom mix color layer of Annie’s pinks on the drawer fronts over that, then sand distressed the edges, and applied her soft wax. I love how the handles came out, I just painted them with Annie Sloan Old White, sand distressed and waxed to seal. Looks like I added gilding, but the sanding took off the brass patina in spots showing it’s original luster. ( Notice how the pink tones change in each picture? The first photo is more true to hue, just goes to show you, buy paint in person do not choose your colors strictly from an online source!) I decided to Mod Podge the insides with old Encyclopedia pages from a book my friend Amber passed on to me from her garage sale, and I love books so it’s a perfect fit. 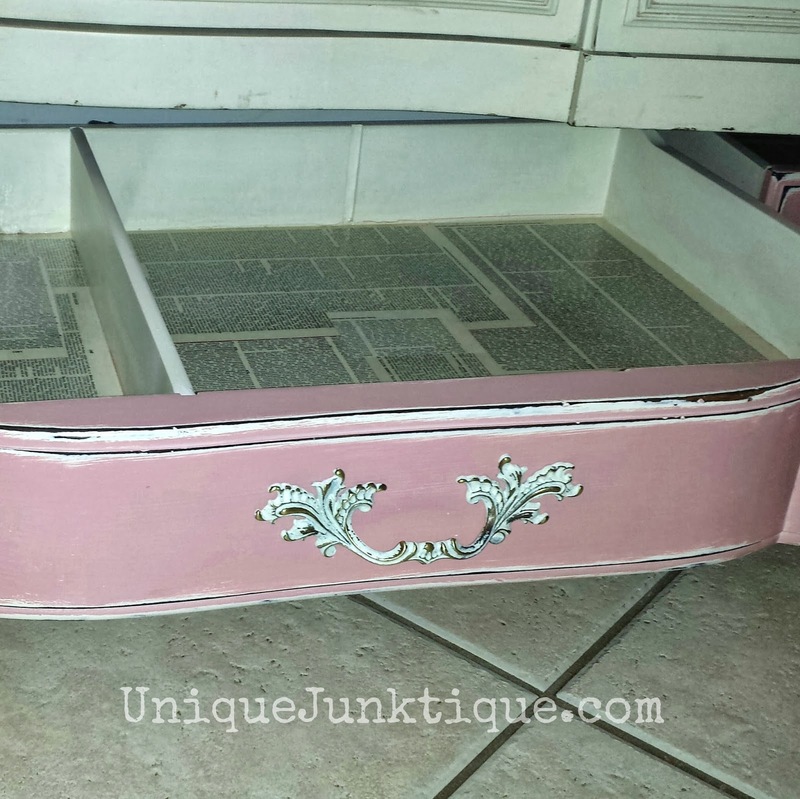 If your wondering the steps I used for applying the decoupage , there are a few tutorials out there that differ, being that the pages I used here are so thin, I simply applied the Mod Podge directly to the inside of the drawer in steps, only covering areas where each page was to be applied, so as not to dry before adding the paper, then carefully applied the paper,then brayed and squeegeed out any air pockets, and applied a top coat of the glue, page by page application, let it all dry. Pin holed any tiny air pockets left, fingered on glue over them to smooth out, then laid a top coat of glue. Encyclopaedia paper is extra thin and not so easy to work with! (*** Important Note: I did not wax the bottom area where I planned to decoupage! ***) Then after all was completely dry I finished off the decoupage with Zissers spray shellac for extra durability. Here is a shot of the dresser. Ugg I wonder what they used for the glaze on those handles? Look how yellow they turned, I am so over the shabby chic white, and think it could use some painted details. 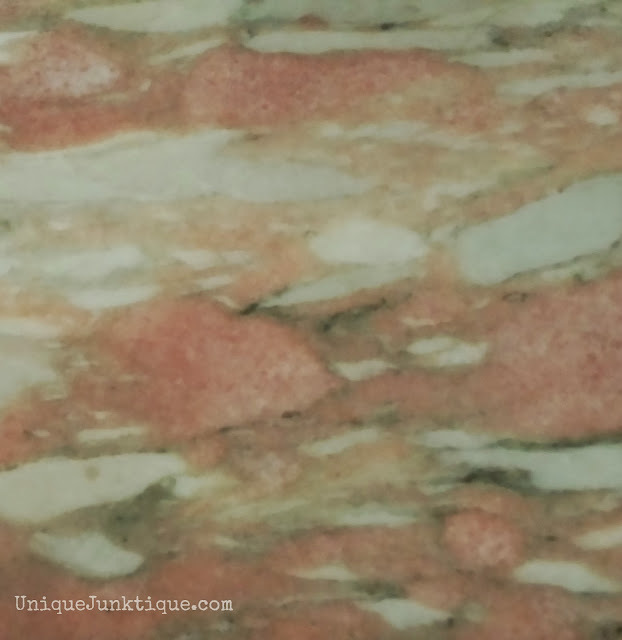 I’m thinking Annie’s French Linen with Old White accents, and perhaps a hint of the pink custom blend. What colors would you choose? 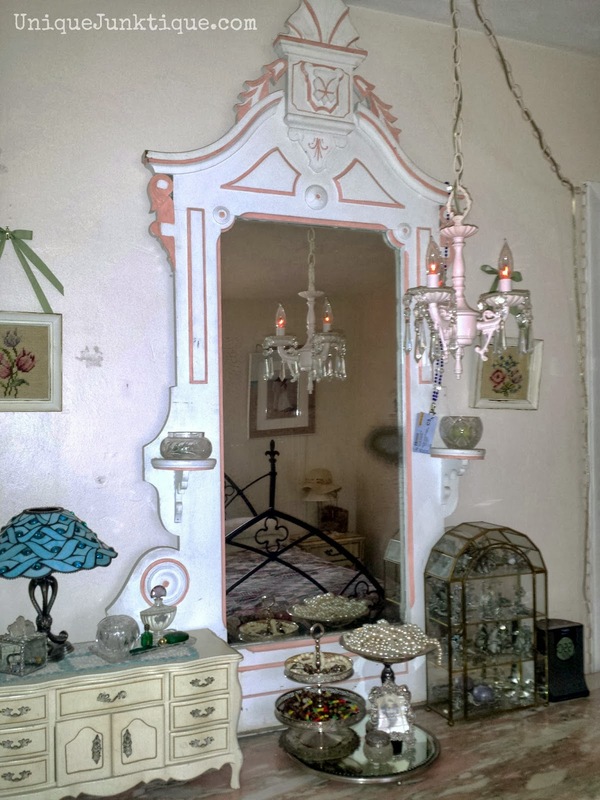 Oh, check out the mirror, isn’t it fab? No I didn’t paint it, I picked it up from an Interior Designer/Jewelry Designer friend of mine, along with the matching vintage stepped dresser (for free), he just wanted rid of it…Thanks Jason! It just happened to match perfectly, so for now she’s residing in my house as is until I tackle that job. 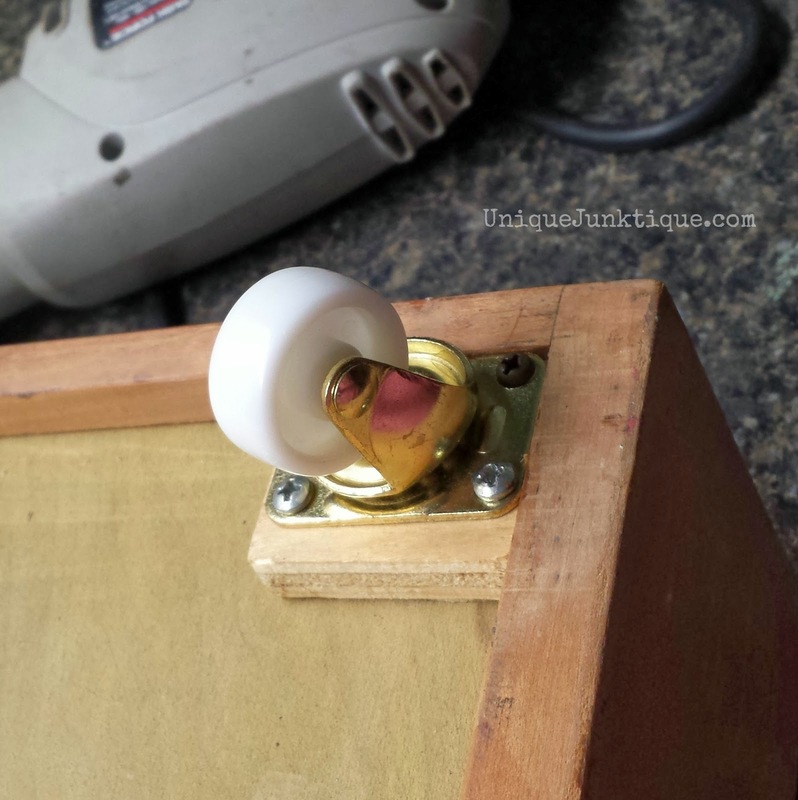 I plan on redoing that cute little french style jewelry music box as well. Hey, I just noticed….the dresser that these junk drawers came from had those french provintial lines! Well I hope this post inspired you, and next time you see an old dresser roadside, and don’t have room in your car for the whole thing ….raining or not, grab those drawers my friend, They can be repurposed into so many fab things! Shared this post on the wonderful sites listed on my Party Page. So pleased to announce that this project has been featured at the following!